With small kids the house in general and a kids room in particular become high traffic areas. So how to keep kids room in order? 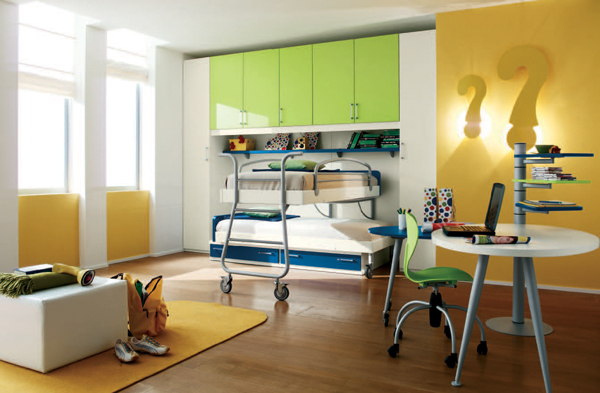 Kids room is often full of toys which usually get scattered across the room or even a house. To avoid that it’s important to several organizers and compartments for storage. When everything has its own place it’s easier for parents and children clean up the room quickly and effectively. Have a storage exclusively for toys, study supplies and some other things. This will help the kids know where to put their things when they don’t need them. Storage baskets, cabinets, drawers and boxes will help keep clutter in check. Kids often play with paints and colors so in order to protect furniture use easily washable and removable covers that if stained could protect the upholstery or other furniture surfaces from staining. These will keep furniture looking new and fresh for longer period. Use easily-washed materials to decorate high traffic areas. Also use rugs to protect the floors from scratching and dulling. Thus you can easily keep the clutter in check and clean both kids room and the rest of the house pretty quickly.